Susan Sontag once remarked it seems the fate of everything today is to end up in a photograph, but for every photograph taken there is also an infinite number not taken; and it is these untaken photographs that are often the most bothersome. During my time at Mersehead I was determined to photograph as many different birds as I could, but at the same time was resigned to the impossibility of ever photographing all those listed in the sightings log. There was, however, one bird in particular which I felt I had to photograph before I left: egretta garzetta, or the little egret. Little egrets only began to nest in Britain in 1989, and did not breed here until 1996. They are mostly found along the south and east coats of England and in Wales, but in recent years have been moving further and further north. I do not recall ever having seen one before coming to Mersehead, but it did not take me long once I arrived. 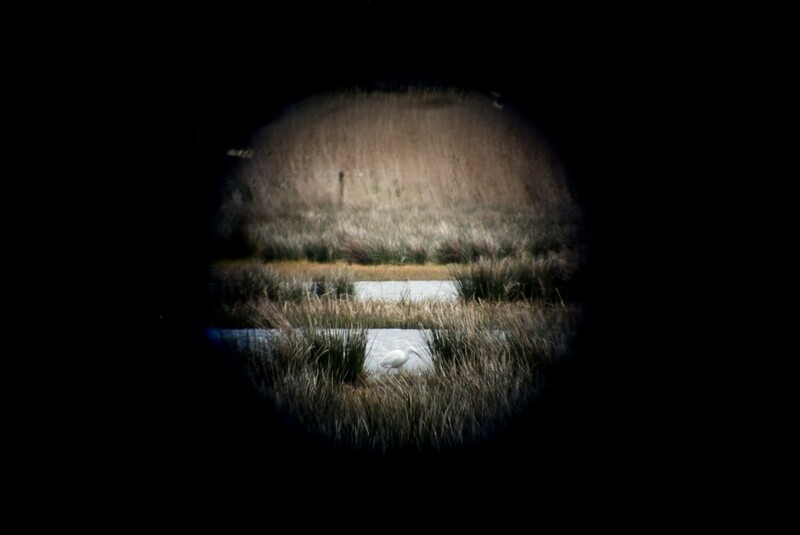 My first encounter was on a grey day near the Bruaich hide; scanning the tall reeds with my eyes I saw a white shape briefly appear in one of the gaps. I made for the spotting scope, hoping to get a better look, but by the time I found the right spot, the bird – its identity still a mystery – was nowhere to be seen. Still, I kept looking. A few minutes later and just a little further up the line of reeds, I caught another flash of white, then another. As I watched, I could make out the shapes of two heron-like birds, only pure white. Definitely not swans. I looked on as they snuck up and down the line of reeds with surprising speed. I tried to photograph them then, but they were too fast for me. Only emerging into clear sight for the briefest of seconds, all I managed to capture of them was a few indistinct images. Eventually, I lost sight of them completely and, bowing to defeat, continued on my way, resolving to look again for these elegant white birds on another day. 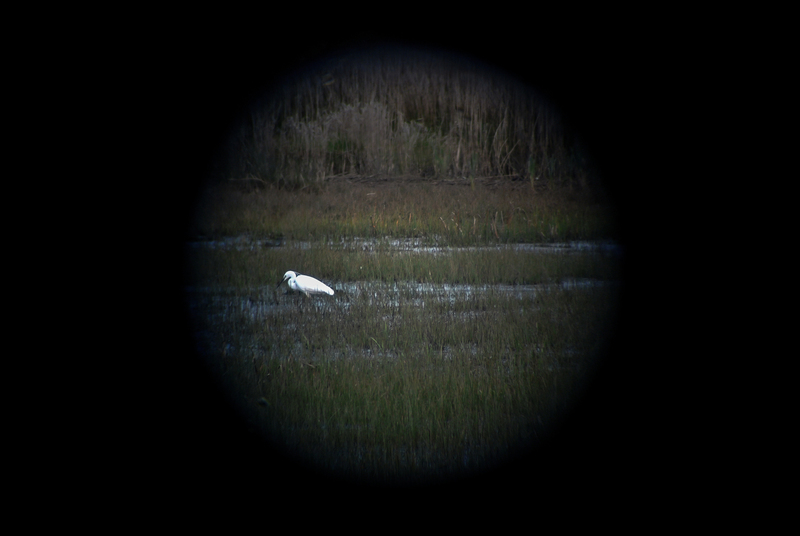 Later that night, I looked them up in one of the reserve’s many bird books: egretta garzetta, or the little egret. Egret: I knew that name from somewhere. Certainly, I remembered it from the sightings board at the reserve visitor centre, but that was not the only reason it was familiar. I knew I had read it somewhere else, and that it was important. A few days later I remembered where. In the late Victorian era, over ten tons of feathers were brought to London every week from all corners of the British Empire so they might feature in extravagant feather displays atop ladies’ hats. Fine white feathers, like those of the egret, were particularly desirable; and the finest egret plumes, known as ‘aigrettes’, were taken from adult birds during the breeding season. To acquire the feathers, hunters had to kill the birds, which inevitably meant their young were left to starve in the nest. In 1889, outrage at the inherent cruelty of the plumage trade, and the plight of the egret in particular, prompted a group of women to come together to protest the use of feathers for fashion. This group, which first met at the home of Mrs Emily Williamson in Didsbury, was the embryonic organisation of what went on, just fifteen years later, to become the Royal Society for the Protection of Birds. So, although it is the avocet that – for good reason – is the bird featured on the Society’s logo, in a sense the RSPB is here today because of a desire to protect the egret. Once I realised this, getting a photograph of the little egret took on a new importance: I wanted one not simply as a record of the birds I had seen at Mersehead, but also as a nod to this larger history. I tried several times to photograph the little egret, but as I neared the end of my residency I began to fear I would have to leave with only the indistinct trace of that first encounter. In fact it was not until my last evening on the reserve I got the photograph I was looking for. 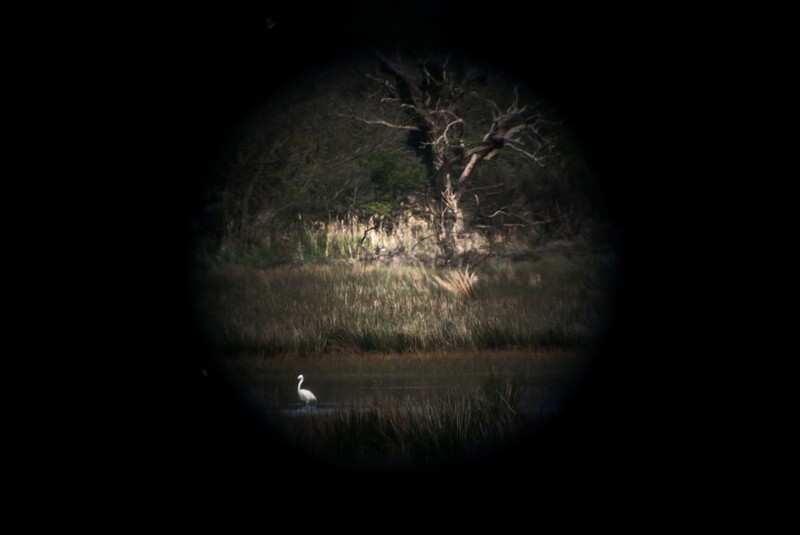 I saw the first flash of white from the Bruaich hide, it was distant but clearly visible through the spotting scope: a little egret paddling in the water. Again I watched it move up and down the side of the reed bed seeking fish, creeping along until suddenly moving in to strike with its long black bill. I stood and photographed the egret for some time before it retreated deeper into the reeds and out of sight. My photographs from this occasion show it much more clearly than before and I could probably have left the reserve happy with those, but I decided to check the Meida hide, just in case. I am glad I did. As soon as I came into the hide I could see it through the far right window, clearly visible with the naked eye: another little egret. Again I set up the spotting scope and began to take photographs. This little egret was still – though not like a statue for it moved its head and fluffed its feathers – with its feet planted firmly in the shallow water, the best kind of avian model. It must have been half an hour I was in the hide, photographing little other than that one little egret. Fully aware I may not have another opportunity, I was eager to ensure I had at the very least one good photograph to take back with me. I might have stayed there longer, but eventually my model decided that it was teatime and skulked away out of sight to fish. That, I decided, was also my cue to leave. Much of my time in the two weeks since I returned to my desk in Glasgow has been spent going through the material gathered during my residency, which includes sound recordings and a lengthy journal in addition to two thousand, five hundred and ninety-one photographs: a snapshot of everything I saw and experienced in those five weeks. Even when faced with all this material, however, I am aware there are many photographs that remain untaken, but this will always be true no matter what the endeavour. I’m just glad I got this one. This post was originally published on 25th May 2016 as part of my SGSAH-funded residency at RSPB Mersehead. Original URL: http://www.rspb.org.uk/community/placestovisit/mersehead/b/mersehead-blog/archive/2016/05/25/egretta-garzetta-or-the-little-egret.aspx.